It'll be available as a free update on May 17th. Minecraft is available on almost every platform known to man, so when the Wii U version launched last December, most people responded with a shrug. Heck, you couldn't even use the GamePad for inventory management. 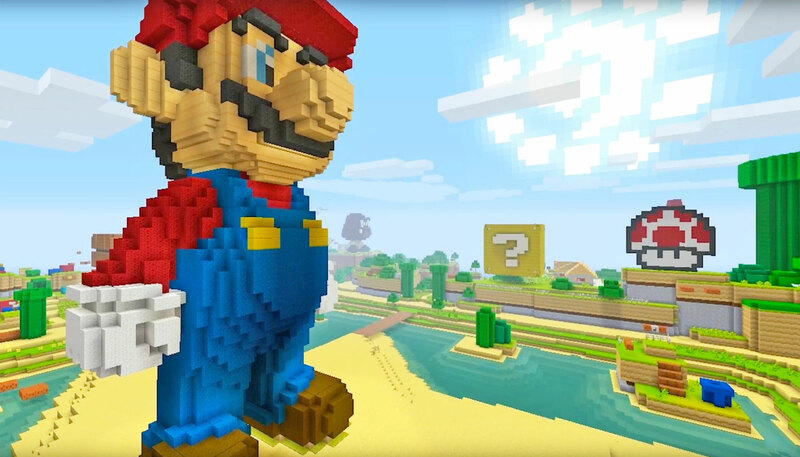 To makes the console edition a little more attractive, Nintendo has teamed up with Mojang for some special Mario-themed content. It'll be available as a free update in May and offer a bundle of character skins, item textures and music ripped from the portly plumber's world. There will also be a pre-made Super Mario-themed map, just in case your thumbs aren't up to the challenge of crafting one from scratch. Nintendo says the new material is inspired by Super Mario World, Super Mario 64 and Super Mario Sunshine. As the player, you can choose to dress up as iconic characters including Mario, Luigi and Princess Peach, or mischievous foes like Bowser and Wario. My personal favourite is Toad in his delightful Treasure Tracker gear. With a flashlight on his bonnet, he seems perfect for some subterranean mining. The house of Mario will also be launching a retail version of Minecraft: Wii U Edition on June 17th, which will cost $29.99 and come with the Super Mario pack on the disc. Such an addition won't change the Wii U's dwindling sales, but looking at the console's lineup this year -- which has little more than Paper Mario and Tokyo Mirage Sessions on it -- this could turn out to be a real highlight. Unless Nintendo has some surprises planned for E3, of course.